That’s the ball game! BVB find an offensive concept that works after months of tinkering. Against Mainz two play-making structure givers on the wings created a hidden diamond with diverse creative potential. 30 shots, 11 on goal, and four went in, with many dangerous attacks that fell just short – providing BVB full penetrating power against the strong pressing of Mainz. In a further development of the 4-1-3-2 system from the home match against Real, Klopp’s team showed the best offensive performance of the season so far against a very disciplined form of midfield pressing that Mainz also quite flexibly interpreted (alternating between 4-1-4-1 and 4-2-3-1). In the 2-0 against Real Madrid, Oliver Kirch occupied the deeper six position next to a disengaged eight. In this role he can structure the first buildup phase well and, via his energy in this area, control much more space in front of the defense during possession changes. Nuri Sahin had huge problems with his movements in this position this season. Sahin’s individual offensive quality has now been incorporated differently. Instead of focusing on the buildup, he took a free, box-to-box role on the right. Early in the game he often moved into the Zehnnerraum (ten space) while also scattering diagonal space-creating runs. This occupied the opposing midfielder and created momentum for his nearby teammates. In this role Sahin could use his passing strength, as he perfectly demonstrated for Dortmund’s second goal and he could bring his enforcer skills, that in recent months best represented his game, into higher zones in the counter pressing. While Sahin was allowed to drift freely through the midfield, other players attended to the structural balance between defense and attack. Henrikh Mkhitaryan and Milos Jojoc started on the wing positions and interpreted them in exceptionally complex fashion. Both are similar types of players who can also play as eights or tens and have an excellent grasp of structures. They made themselves adaptable in various ways. Both were inversely positioned so that they could start typical dribbling actions towards interline space (“Robbery” style). More often the two prolific sprinters made impressive runs without the ball around the freely moving Reus and Lewandowski. Thus they set out as combination players in the attacking half spaces when available or went into the point of the formation for through balls (again, see Sahin’s pass to Mkhitaryan for Dortmund’s second). These attacking elements also added presence in the buildup game. They situationally advanced into the defensive half space early and acted as halfback in a diamond. Earlier this season Reus, Aubameyang or Hofmann occupied these areas, but in a completely different orientation. They briefly fell mainly to higher zones for unleashing Ablagen (direct one-touch passes) in behind the defense. Mkhitaryan and Jojic occupied and dominated these connection spaces, directing the passing forwards. Instead of supporting the build-up, they stuck with their tasks. This led to far-reaching changes in Borussia’s play structure. Recently, the black and yellow were pushing their build-up play to the outside and were then forced into predictable play along the sidelines. Mkhitaryan and Jojic supported the fullbacks and central defenders deeper and were able to create a second line of construction in the center of the pitch. The defense took care of their position to play by covering less ground: The full-back didn’t move as early, and the central defenders didn’t fan out as wide. Therefore, Kirch no longer fell back between the defenders, but held his position as a six. Borussia were also stable after early turnovers, as they were closer to their defensive positions. Interestingly, the full-backs were still effective on the attack. Because of Dortmund’s greater presence in the half spaces, Durm and Piszczek found more space and had more opportunites near goal. 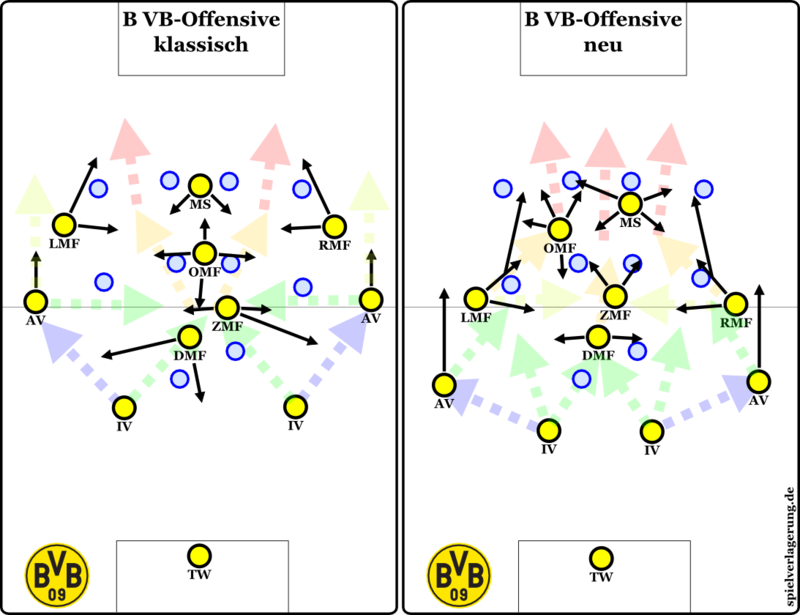 Basically, the Dortmund attacks were unpredictable in their structure. Usually, Klopp’s players try to move first into the six space, then into the intermediate line space, and then use the continuously steep wings. Now the game often centers in the half-space and can develop from there. The combination in the intermediate line space is variable and totally diagonal. At the same time this supports Sahin’s free role in the center and makes it difficult for the opponent to focus on the constantly changing formation. The depth was unpredictable from different spaces. Lewandowski could move wider and get free more often in the channels of the defense. Frequently this movement brought Reus out of the center as the dynamic forward. Also, the steepness of the winger was more difficult to control because it often happened from closer, confusing situations. The change to the basic structural alignment of Dortmund’s forward motion. Naturally this is all extremely variable. I just hope that the concept is understandable despite all the abstract arrows. This restructuring not only had an impact on their build-up play, but was also evident in their transitions following a change in possession. 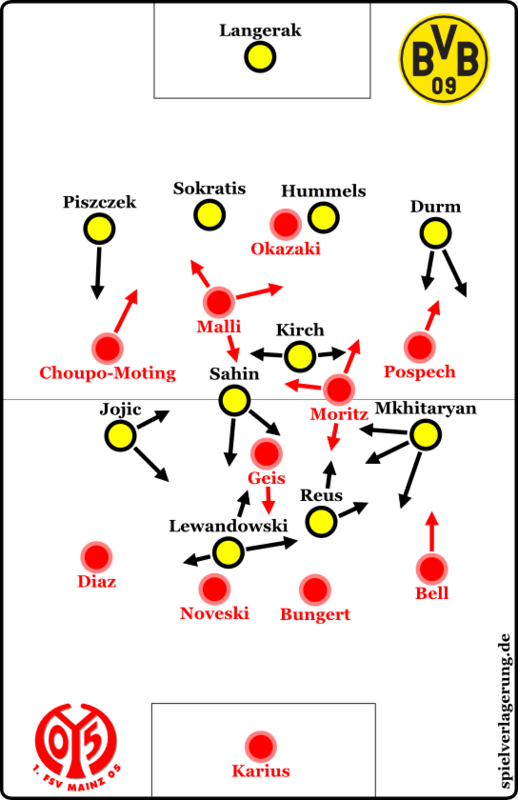 Mkhitaryan and Jojic did not shift only vertically, which is typical of Dortmund’s wingers. Depending on the situation, they called for the ball directly in the half space. There they could play around the Mainz counter pressing and release recently won turnovers out wide. Moreover, the second pressing line of Mainz was overloaded when the more defensive players moved forward, creating space in front of the defense. Reus and Lewandowski tested these spaces as in previous games. With their dribbling skills and very good coordination, during and after driving with the ball, they are very successful when outnumbered and allow the deeper players to move up. Thus, Borussia play around the problem of missing ball circulation in the offensive zone and their generally deeper positioning. On these points, the old attack structure is nominally superior. In general, the new system is less clearly planned out in finalizing the attacks and is based more on improvisation. Borussia compensate for this with the creative impact of Reus and Lewandowski and the enormously adaptable movement of the two wingers and are hardly less stable or successful than usual. In fact, they seem even somewhat consistent, since the players have individually more suitable environments. The biggest beneficiary is Mkhitaryan. As a ten he had hardly any dynamic with the wingers in his immediate vicinity . So he could not combine , but was forced to prolong his dribbling and make rather predictable vertical passes. In this inappropriate, static situation he made many predictable bad passes, which unfairly earned him a reputation as an uncreative or weak passer. In the lateral role, the Armenian now has three players or more in front of him than when he was oriented centrally.Through their diverse movements the formation is less clear and the situations are more dynamic, which is why he can utilize the strengths of his complex decision-making much more often. Reus can also have more effective penetrating power because the opposing players have a more difficult time finding his position amongst the chaos. He can dribble at different speeds, either at the opponent or into the space (or both) so that his actions are quite difficult to read in overload situations and have more of a surprise effect. Since he prefers to keep the ball longer than Mkhitaryan, it also harmonizes well with the rhythm of Lewandowski. Therefore it is not generally so that he is stronger as a ten and Mkhitaryan as a winger. In the current tactical situations, however, this division provides more tactical variety, which benefits both of them; especially given the low Dortmund presence in the intermediate line space. It will be very interesting to see what Dortmund makes of the new opportunities. As effective as the game was against Mainz it will be difficult to preserve the system. Firstly, there is the question of defensive stability. The early moving up of the sixes can cause problems against teams that have a very good connection between the wing and half-space in counter attacks. The system also benefited from the fact the offensive players were completely occupied with a creative passing game. With stronger defensive players, like Bender and Grosskreutz, the processes would have to be adapted and the variability restricted. The same applies when BVB want to drive a more direct counterattack. Aubameyang can not be integrated in the same way as Jojic, Mkhitaryan or Lewandowski. In Jojic and Mkhitaryan, Borussia have two extremely rare and irreplaceable players. However, Hofmann could possibly grow into a similar role and the Bulgarian Yordanov from Dortmund’s second team has similar potential. The Lewandowski departure will also raise new questions. The Pole’s excellent integration and form in crucial periods of the season is somewhat overstated in its importance for Dortmund’s game, but in the current mold it is really very difficult to replace. Hardly any striker can replicate his holdup play and ability to distribute in chaotic outnumbered situations, which is especially important in this new formation. However, possible adjustments have already been demonstrated. In the Real return game, against Bayern and against Wolfsburg in the cup, the black and yellow basically played mixed systems with elements of the “old” and “new” offensive structure, which worked very well indeed. Let’s see what the long term will hold or whether these options will be able to lay the foundation for a (tactical) rotation for Borussia. Big thanks to @rafamufc who translated this piece! Great analysis. I watched this game and I could not figure out how Dortmund were playing but they were dominant. You have improved my undertanding. Most managers would be giving up on Mkhitaryan and declaring him a bad fit but Klopp has tweaked his set up to bring the best out of him. The translation is much appreciated as google translate does not seem to work on your site.